The Diamondbacks and Padres both record 7 hits tonight but the difference tonight is 3 of the Padres hits were in the form of the long ball. For the Padres Yonder Alonso, Chase Headley, and Carlos Quentin all hit a home run and beet the Diamondbacks 9-3. For the Diamondbacks Justin Upton celebrated his 25th birthday with a RBI in the park home run and Aaron Hill would get a 4 bagger the easy way. Ian Kennedy would drop to 11-11 on the season as Clayton Richard improved to 11-12. tomorrow the Dbacks will throw Joe Saunders 6-10, 4.22 ERA and the Padres look to Edinson Volquez 8-9, 4.18 ERA. 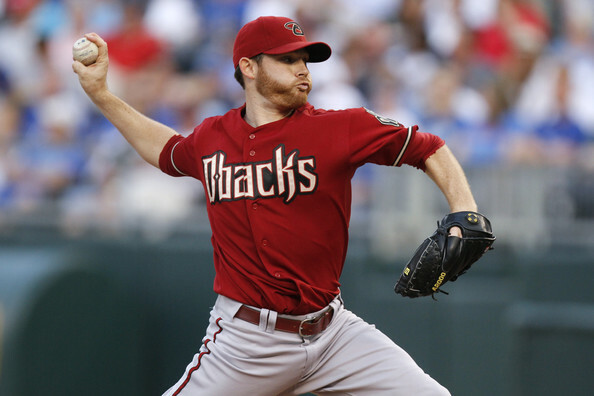 The Dbacks look to avoid a series sweep at home as the Padres look for their 7th win in a row. 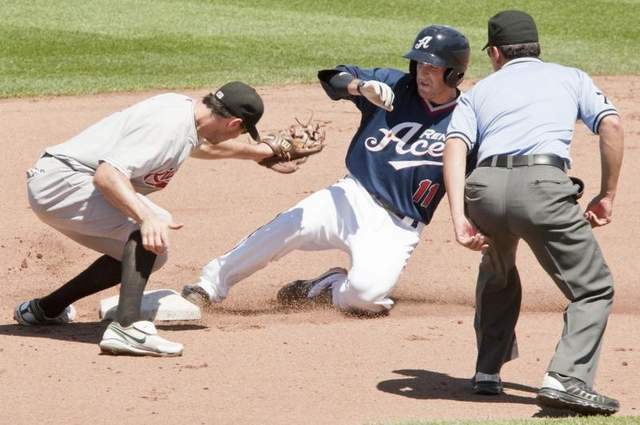 Walk Off Fashion: In today’s game the Reno Aces would need 2 runs in the 8th inning and 1 in the 9th to send this game into extra innings. in the 9th inning the Aces Mike Jacobs would get a 2 out walk and would get a pinch runner (Wladimir Sutil). Cole Gillespie would hit a 2 out Double to left field that would travel all the way to the corner scoring Sutil from 1st.Taylor Harbin would get an infield single moving Gillespie to 3rd but the inning would stall there at a tie to send the game into the 10th. Jensen Lewis would pitch the 9th and 10th innings and would give up 1 run in the 9th and slam the door on the Grizzlies in the 10th to get the win. So now it would be up to the Aces to make a comeback in the 10th. The inning starts with a perfect bunt single by Tyler Kuhn, followed by a sac bunt from pinch hitting Brett Tomko to move Kuhn to 2nd. A.J. Pollock would be intentionally walked by the Grizzlies in what would be a fatal error. In walks second baseman Tyler Bortnick battles to a 2-1 count and with ice water flowing through his veins turns on a fast ball from Dan Runzler and hits a ball past a diving 3B Conor Gillaspie that would roll all the way to the corner for a WALK OFF RBI single. As Tyler Bortnick rounds 1st base he jumps in the air with a fist pump as the Aces dugout storms the field and celebrates at 2nd base with an ecstatic Bortnick. The Aces get the W coming back to win it in extra innings. Konrad Schmidt would continue his outstanding hitting display going 2 for 5 with 2 RBI. Taylor Harbin would finish 2 for 5 scoring twice with a double and a RBI. Cole Gillespie would go 2 for 2 with 2 doubles, 1 run, and a RBI. 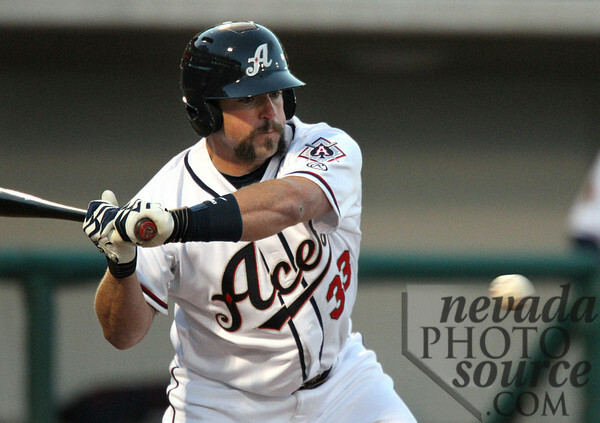 Aces will close the series tomorrow with LHP Zach Kroenke 6-4, 5.78 ERA against RHP Yusmeiro Petit 6-6, 3.48 ERA. The double A Baybears take a page out of the AAA Reno Aces playbook and come back in the 9th to score 1 run and force the game into extra innings. Down by 1 run in the top of the 9th the man child known as Brent Clevlen would hit a solo home run(HIS 2ND OF THE GAME) over the center field wall to send this game into extra innings tied 3-3. With a RBI double from Matt Mangini Alfredo Marte would score to take the lead. Bo Shultz would strand the winning run in the 10th slamming the door on the home team to win the game. The 5 game series continues tomorrow. The Visalia Rawhide would get dominated 13-5 in a loss at home VS Stockton. Two of the 5 runs from Visalia would come from home runs from DH Jonathan Griffin and CF Keon Broxton. Griffin 1 for 4 would score once with2 RBI’s. Stockton would outhit Visalia 16-9. Game notes: I have had the pleasure to watch all of Tyler Skaggs starts in Reno and whiteness the greatness he possesses as a starter, and today all of Major League Baseball got to see the same. Tyler Skaggs had some quality pitches today. 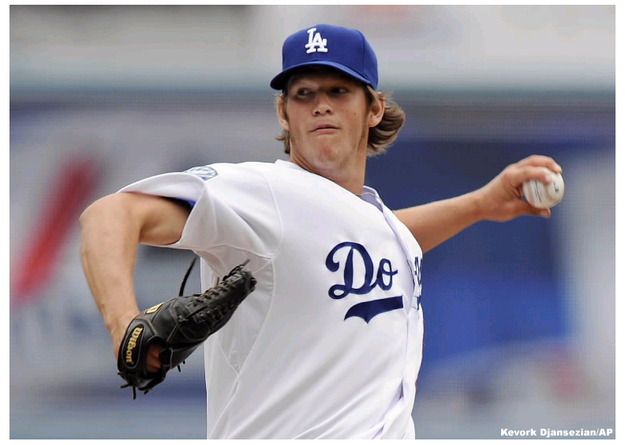 His curve ball was his go to pitch. Donovan Solano has reached base in nine straight appearances and in the 6th Tyler Skaggs walks Donovan Solano and Jose Reyes back to back & The bullpen is up and moving. Tyler Skaggs wins his first MLB start as a pitcher in the bigs. Jacob Turner’s first career start was a quality start: 6 IP 4 Hits, 5 Ks, no walks. He Retired final 10 he faced. Final line for Tyler Skaggs in his MLB debut: 6.2 IP, 3 H, 2 ER, 5 BB, 4 K. #StandingOvation Skaggs was interviewed after the game and when asked how it felt to pitch in his first MLB game he answered “It was phenomenal,” when he was asked what it felt like to hear the crowd cheer and give him the standing O as he walked off the field he said. “I mean, the greatest feeling I’ve had so far in my life.” when asked if he was nervous on the mound during his first start he replied “It got pretty nerve-wracking,” Skaggs said, “but I feel like I did a pretty good job.” The Dbacks catch a break in the first game when umpire Jim Joyce blows a call at second base on a sliding Gerardo Parra, Donovan Solano applied the tag to Parra before he got to the bag but Jim Joyce called him Safe. Parra would then score on an Arron hill base hit. The Mobile Baybears jump all over Stevenson Garrison in the first inning as he gives up 3 runs on 4 hits. Brett Tomko would give up a run on 2 hits in the 2nd inning. Mobile would answer and add 2 more runs in the 2nd on a double by Alfredo Marte and singles by Chris Owings & Matt Davidson. In the 3rd inning the hitting machine known as Brent Clevlen hits a triple to left field. He would then score on a sacrifice by Matt Mangini. In the 5th inning Francisco Martinez singles on a line drive and Brad Miller doubles on a fly ball to centerfield which would score Francisco Martinez. The Mobile BayBears would make it a 7-2 ball game in the fifth inning when Brent Clevelen walks and Ed Easley doubles on a line drive to centerfield. the Baybears would tack on another 2 runs on the Yahtzee ball from the beast Brent Clevlen. The Generals would score in the 8th on Chih Hsien Chiang’s (say that 5X fast) sac fly. The win goes to pitcher Brett Tomko after he went 5 innings allowing 2 earned runs on 5 hits. Brent Clevlen ended the night 2 for 2 with 2 RBI’s and 2 walks. The Mobile Baybears improve to 1 game over .500 at 65-64. Josh Bell with his fourth home run in three games gets the Aces a one run lead in first inning. Mike Jacobs gets his 14th double of the year but is stranded on base to end the 1st. 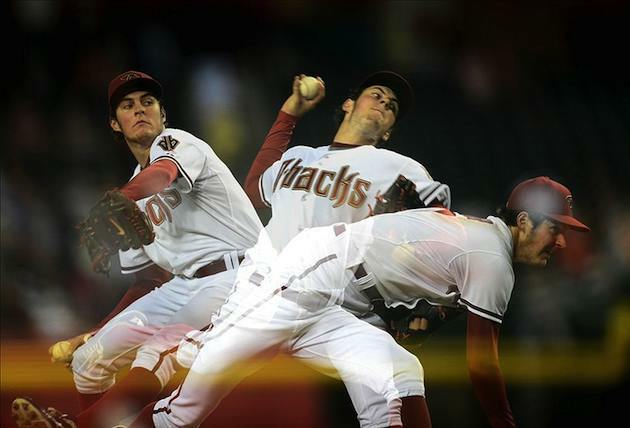 Trevor Bauer is looking great early with some zip on his fast ball and a devastating curve ball. Aces threaten in the 6th with a Josh Bell base hit and a walk by Mike Jacobs but Cole Gillespie leaves them stranded. Aces down 3-1 as Trevor Bauer takes the mound in the 7th he retires the side without a run. Tyler Kuhn with a lead off double for the Aces. Tyler Graham with a sac bunt moves him over to 3rd. Ryan Budde strikes out so the Aces go to the bench with Tyler Bortnickto pinch hit and Tyler gets some help when the SS boots the ball and a run scores. Adam Eaton hits a ball down the 3rd base line and it goes all the way to the wall for a 2 RBI double and Adam Eaton Ties the game! Adam Eaton is by far the best hitter in AAA and he shows it collecting his 44th double on the season in the most crucial at bat in the game! The grizzlies would score a run on an error in the top of the 8th to take the lead back 4-3. In the bottom of the eight Mike Jacobs hits a single through the 5/6 hole into left field. Tyler Kuhn to the plate with 2 out and tying run at 2nd and he grounds out. Grizzlies add an insurance run in the 9th on back to back doubles. The aces are retired in order in the ninth and the ball game is over. Trevor Bauer gets a no decision, Matt Gorgen gets the Loss for the Aces but they maintain a 3 1/2 game lead. The win for the Grizzlies goes to Dan Otero. 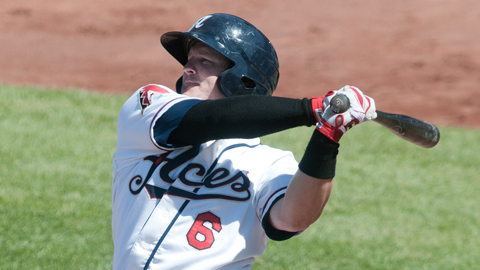 For the Aces Mike Jacobs was 2 for 2 with 2 walks on the night and only Bell & Jacobs record a multi hit night. Well there’s not much to report in this game tonight except Jonathan Griffin’s HOMERUN in the top of the 9th to left field. Bradin Hagens for Visalia went 8 strong innings giving up only 1 hit and 3 walks. He does a fantastic job tonight before turning the ball over to closer Blake Cooper who blows a 1 run lead and loads the bases and walks in the tying run! So they go to the 10th and San Jose retires the side in order. Joe Panik singles on a line drive to left field and Adam Duvall walks. Bobby Haney would hit a sac fly walk off to score the winning run for the San Jose Giants. Jose Valdez earns the win for San Jose.